my 18-month-old enjoying the final product! When I was expecting my first child over 8 years ago (! ), I enrolled in a hypnobirthing class. One of the relaxation exercises our instructor walked us through was imagining a kitchen in full detail, complete with our favorite meal cooking on the stove or in the oven. The meal I imagined was chicken noodle soup on the stove, with bread cooking in the oven. I was a little sickly as a child and teenager, suffering from asthma and recurrent sinus and respiratory infections. My mom would make this soup often when I was ill, and in addition to helping heal my body, it was a great comfort to my soul. Though homemade chicken noodle soup is amazing, turkey noodle soup is out of this world. When we travel for Thanksgiving, we make sure to grill a turkey some other time in the winter, just for the carcass to use for stock. I swear, it's liquid gold. Homemade stock may sound intimidating. But I know you can do it! The more time you have, the more flavorful your stock will be, but a delicious chicken stock can be made in as little time as an hour, and it's mostly hands-off time. According to Alton Brown here, stock is made only with bones and broth is made from meat, so really this is a hybrid of both stock and broth. On years when I do cook a turkey on Thanksgiving, I almost anticipate the day after Thanksgiving more, when I simmer a huge pot of turkey stock for hours. The smell in my house is divine! A chicken yields a dutch oven pot full of soup. A turkey will yield 2-3 times that amount of stock. I usually use a carcass to make the stock--from a rotisserie chicken, or a grilled turkey--and then use meat I saved from the bird for the soup. With a chicken in particular you can use the entire raw bird to make the stock, and then shred some of the meat for the soup. Alternatively, you can use a collection of bone-in chicken pieces to make the stock. Mom often cooks everything but the breast meat for the broth and cooks the breast meat after the broth is completed and strained. That way the meat isn't overcooked or tasteless because all the flavor has cooked out (once the breast is cooked, pull it out and shred it before returning it to the soup for serving). Because a turkey carcass is usually much bigger, double the other ingredients. Place carcass in a large pot. For chicken a dutch oven size is sufficient; for a turkey I use a large stock pot. Fill with water to cover the carcass by at least an inch--and more will result in more stock. Quarter the onion, scrub the carrot, and wash the celery rib. Then add vegetables and bay leaf to the pot. Bring to a boil over high heat, then reduce heat until the stock simmers. Simmer for at least an hour, preferably several hours. Remove and discard all of the solids from the stock (a spider makes this easy). On fat: sometimes a layer of fat is evident on the top of the stock. Often when I use a chicken carcass there's not much and I'm too lazy to remove it, but if you see a lot and would prefer to do without the fat, here's a few options. The easiest (and probably most time-effective) method is to use a fat separator. The fat rises to the top and you can pour off the liquid underneath. Another option is to use a ziploc bag. Place the stock into the bag and hold it still for a minute so the fat rises to the top. Then snip off a corner of the bag to release the stock, then pull the bag away once everything is out but the fat. And a third option: refrigerate the stock to solidify the fat. You can then spoon it off, being careful not to remove too much stock. On storage: Stock freezes beautifully. I have used both mason jars and ziploc freezer bags. The gelatin in stock will turn it semi-solid in the fridge. Don't worry, it loosens right up as soon as you heat it. These measurements are flexible; tailor them to your tastes. Bring stock to a boil. Peel and slice carrots; wash and slice the celery. Add 1 teas salt and vegetables and cook until crisp-tender, about 12 minutes at my altitude. I usually add the chicken at this point, but it doesn't really matter when you add it, just that you do! Then add egg noodles and cook for another 10 minutes or so, until the noodles are tender. Add thyme and rosemary. If you're sick, make sure you stand over the simmering soup and breathe in the fragrant steam. Place in bowls and serve with crusty bread or grilled cheese sandwiches. During a visit to Germany in 1986 I tasted Nutella for the first time. Like a number of foods I discovered during my years of Air Force assignments and related travel, Nutella was not well-known in USA at the time. It almost goes without saying; I liked it, especially on sourdough bread. Some acquaintances found my fondness for bread and chocolate strange, even when I reminded them that Americans ate plenty of chocolate covered donuts (maybe multi-colored sprinkles won them over). During my eight years living overseas I continued to indulge in Nutella but the best chocolate and bread combo I ever ate was found at a Belgian patisserie near my home; the baker slathered chocolate between croissant halves. I admit to indulging myself often during my three years there. A few years after returning to the states, I read about Grilled Chocolate Sandwiches in a cookbook by one of my favorite contributors to The Washington Post Food section, food scientist, Robert Wolke (unfortunately he no longer writes for them). He introduced me to a short, easy recipe which combines the flavors, if not the texture, of those chocolate croissants I still miss. Heat a nonstick or cast iron skillet or griddle over medium heat. Melt a pat of butter and place one slice of bread in the pan, moving the bread around to absorb the butter. Arrange the chocolate chips on the bread covering the slice well. Top the chocolate with the second slice of bread; let cook until the chocolate is beginning to melt and the bottom slice starts to brown. Be careful with the heat--you know your own stove top and may need to lower the heat so you don't burn the bread before the chocolate melts. When the bottom slice is golden brown, carefully flip the sandwich using a spatula. This is easiest if you use both hands; flip the uncooked side on to your non-dominant hand moving rather slowly in case there is still unmelted chocolate which might fall out. Once the flip is completed, melt another pat of butter and place the sandwich back in the pan, uncooked slice down. Tuck in any chocolate chips that may have fallen. Continue cooking until the second piece of bread is browned as well and the chocolate is melted. Remove to a cutting board and slice; wait a minute or two and enjoy. This sandwich is best when you combine quality ingredients. I like the flavors of sourdough bread but it isn't necessary. Just try for something with some heft and good flavor. I've seen photos of these using baguettes, but I think the chocolate would melt out of any holes. I use Callebaut chocolate chips with a higher percentage of chocolate. These chips are not American so they have less wax in them (they don't hold together well in a cookie) and they melt beautifully. If you can't find this brand, you might try those at Trader Joe's since that store imports some chocolate items from Belgium. I've not tried the chocolate chips so I can't vouch for them. The chocolate bars they sell (Pound Plus) are good, though. Even though you may have a great stove-top recipe for butternut soup, this version may come in handy when you have to be away from the kitchen. Combine the squash, onion, apple and broth in a large slow cooker and add 1 teas salt. Cook on low for 6 hours. Check that the vegetables and apples are very soft. Allow to cool for 15 minutes. In batches, blend the ingredients until smooth. Return to the slow cooker and add cream and nutmeg. Reheat on the low setting, if necessary. Serve soup drizzled with cream. Almost any winter squash (excepting spaghetti or the small Delicata) would work here. See this page for examples. I am partial to banana squash. Slivers of red-skinned apple are also a great garnish for this soup. For some, the end of summer came several weeks ago, but in Albuquerque summer lingered this year, so here's one last "summer" recipe. This can be cooked anytime you find a good eggplant, however. Gardening in the desert was a disappointment this summer but it has taught me just how hard plants try to do their life's work, in spite of strong hot winds, drought, insect attacks, and disease. Although we experienced all these traumas this summer, I got several eggplants, some tomatoes, onions, lots of garlic, and the herbs needed for this recipe. I'm glad since this mostly veggie sauce is great for pasta or polenta and I like to cook it at least once each summer. Skip the anchovies for a vegan dish. Preheat the broiler and place peppers on a baking sheet under the broiler, skin side up and cook until blistered. Stack the pepper quarters on top of each other and cover; allow to steam for 15 minutes and peel. Lightly brush a sheet pan with oil and place the eggplant slices on it. Brush the tops of the slices with oil and broil both sides until browned. Remove from oven and when cool enough to handle, dice the broiled eggplant slices and the peeled peppers. Heat the oil in a Dutch oven. Add the onion, garlic, anchovies, and the parsley. Saute until the onions are softened. Add the peppers, eggplant, tomatoes, olives, capers, oregano and salt and pepper to taste. Let simmer for 30 minutes. Cook the pasta. Stir in the sauce and top with more parsley. Pass the grated cheese among diners. Note: I've frozen this sauce successfully. A few weeks ago, next to some mountains in Utah, two boys and their mom pulled a neighbor's blackberries out of the freezer. They grabbed the cream from the fridge that had been delivered overnight from a local dairy. They consulted the recipe at the end of the picture book they had checked out from the library a few days before. The boys whipped the cream with an electric mixer. Zzzzzzzh. In just a few minutes: whipped cream. "You should lick the beaters," the woman said to her boys. And they did. Mmmmmmm. 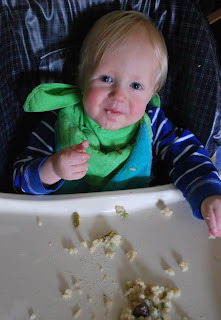 The woman defrosted the berries in the microwave, then the boys enjoyed smashing the berries with a fork. Everyone took a turn pressing the berries through a colander. Then the boys sprinkled sugar over the fruit and together they mixed the fruit into the cream. They placed the mixture in the fridge for several hours. For their afternoon snack, the family ate the blackberry fool, on their back steps, looking up at their mountains. 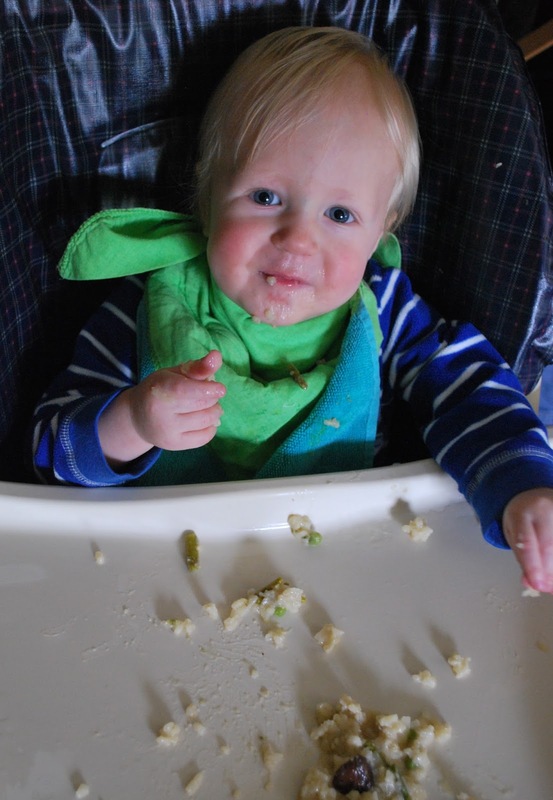 The baby was napping, but he enjoyed the dessert after dinner that night. Something wasn't quite right with their fool, though; it was too runny. The mom thought maybe they should have whipped the cream longer, or maybe used fresh berries. And next time she might reduce the sugar. But that's for the next iteration of this fine dessert! A Fine Dessert: Four Centuries, Four Families, One Delicious Treat illustrates some ways the world has evolved over the last four hundred years, as viewed through the preparation of blackberry fool. The source of the cream and the blackberries, the people that prepare it, the tools they use, and the people that eat the fool change over the centuries. But everyone licks the spoon and bowl clean! As I wrote this post I discovered some criticism about the way this book portrayed slavery in 1810 South Carolina. See here or here for more information. I understand the objections, though admit to conflicted feelings since the book is otherwise so lovely. But be aware and use your best judgement as you read it with children. Mash the berries with a potato masher, large fork, or food processor. With clean hands, press the crushed berries through a colander or sieve to remove the seeds. Sprinkle the fruit with 1/4 c of the sugar. Stir. In a separate bowl, mix together the remaining 1/4 c of sugar, the vanilla and the cream. Using a whisk or whatever kind of beater you have, whip the mixture until it makes soft peaks, but not stiff ones. Fold the sugared berries into the whipped cream. Taste it to see if it's sweet enough. Add more sugar if you need it. There should be streaks of white and purple. Refrigerate for 3 hours or more, and then enjoy! Note: We used frozen berries, which the recipe says you can, but I want to try it again. Our fool ended up too runny. So either we didn't whip the cream enough or there was too much extra moisture in the frozen berries. This is a simple and easy salad made delicious by the lemon and mint dressing. Use this recipe as a guide. If you like more or less of anything change what you add. Toss the cucumbers and salt in a large colander set over a rimmed plate or a bowl. Fill a zipper-locked plastic bag with ice water and set the bag on top of the cucumber slices. Allow to drain for an hour. Thoroughly rinse the cucumber slices under cold, running water and pat dry with a towel. The salad will be considerably less watery if you complete this step, but in a pinch you could skip it if you taste for seasoning before serving. Place the tomatoes into a large bowl and add a tiny bit of salt being careful not to overdo it since the cucumbers will remain salty. Add the cucumbers, onion, and mint and toss gently. Drizzle the oil and lemon juice over the salad and toss again. Season with pepper to taste and serve immediately. A delicious option for corn-on-the-cob season, my favorite time of year. Yield depends somewhat on the size of your ears of corn. With really large ears, I halved the recipe because I knew I'd be the only one eating it and I ate generous servings probably 3 times. But I made it again with smaller ears of corn and there wasn't as much. Cook bacon in a skillet over medium heat until crisp. While bacon is cooking, cut the kernels off the ears of corn. Remove the bacon and let it cool on a paper-towel lined plate. Spoon out all but 1 T bacon grease from the skillet, then put the pan back on medium heat. Add the corn kernels to the hot skillet and don't stir for a couple of minutes until the corn sizzles. Then stir occasionally until the corn is cooked and the kernels have begun to brown. Place the corn in a large bowl and refrigerate for 30 minutes. While the corn is cooling, dice the red pepper and avocado. Chop the cilantro and crumble the bacon. Mix it all together, add the corn, stir in the lime juice, and season with salt and pepper. Feel free to improvise with the ingredient ratios--I added extra avocado when my ears of corn were very large. I'm a fan of strawberries and rhubarb combined. So I'm going to enjoy them throughout the year. This makes a rather thin-spreading jam but it tastes wonderful. Stir 1 c sugar into the strawberries and let sit at room temperature, stirring occasionally to help the sugar dissolve. Place rhubarb and remaining cup of sugar in a saucepan and cook over medium heat for 10-15 minutes until the rhubarb is soft and the sugar is melted. When it begins to simmer, turn it down and stir frequently. Remove from heat and let it cool for 10 minutes. Combine the strawberries and the rhubarb and pulse in a food processor 8-12 times until slightly chunky. Transfer into a glass or plastic bowl and let stand for 15 minutes. Gradually stir in the pectin. Stir constantly for 3 minutes. Let stand, again, for 30 minutes. Ladle mixture into clean half pint jars or other freezer containers. Leave 1/2 inch head space. Freeze upright in the freezer where they can remain for up to a year. Thaw in the refrigerator and use within 3 weeks. When we were last together, Betsy and I tried this recipe. This particular product was made with red rhubarb, but the rhubarb in my garden is green, which won't be as pretty. Of course, it will taste just as good. The original recipe is for breakfast or brunch, but we think it would be a delicious dessert bread pudding. In a small bowl, combine the juice and the cornstarch and stir until the cornstarch is dissolved. Add it to the mixture in the pan and cook for 1-2 minutes, until the mixture thickens, stirring constantly. Remove from burner and cool for at least 10 minutes. Store in the refrigerator if keeping it overnight. Heat the oven to 350F. Grease a 9X13 pan with the butter and arrange 6 slices of bread in an even layer on the bottom. Cut the bread to fit, if needed. Sprinkle the slices with 2 T sugar. Evenly spread the filling over the bread. Place another layer of bread on top of the rhubarb. Sprinkle with the remaining 2 T sugar. Whisk together the eggs, milk, and vanilla in a large measuring cup or bowl. Pour it over the bread layers, pressing down gently to help the bread absorb the liquid. Let it sit for 5-15 minutes until the egg mixture has soaked in completely. Sprinkle evenly with the cinnamon and move to the hot oven. Bake for 30-35 minutes until the top has become puffy and firm and it has begun to brown. Sprinkle with powdered sugar and serve immediately. Serve with strawberries, either sweetened or unsweetened. If you choose to serve this as a dessert, I recommend you leave the bottom layer as is but cut the bread into cubes for the top layer. A variation on a no-bake cookie, these crunch bars are another way to use the tahini languishing in your fridge after you make hummus. The most time-consuming part for me was stirring the tahini, but if you use tahini more often the less it will settle in between uses. Prepare a 9x13 pan by lining with parchment or wax paper. Break up cereal by pulsing in a food processor just until broken into bits. You don't want to turn the cereal into powder. Place cereal in a large bowl. Chop the chocolate. Add the tahini to the chocolate and melt it in the microwave, 30 seconds at a time. Then pour the melted chocolate and tahini mixture over the cereal bits and mix quickly. Transfer the mixture to the prepared pan and spread it out in an even layer. Refrigerate for about 2 hours, until the bars are hardened. Cut into bars and eat right away, then put the remaining bars back in the fridge. These treats begin to melt quickly, so they're best eaten right out of the fridge, which unfortunately limits their portability. I've had this recipe for cooking salmon since sometime in the 90s and I'm not sure where I got it. It is a good, basic recipe, simple and tasty. However, the recipe was annoyingly vague in ingredient amounts. I have included more precise measurements. In a small bowl whisk together sour cream, dill, lemon juice, shallot, red pepper. Season with salt and pepper, roughly 1/4 teas each. Set in refrigerator for at least 30 minutes. Remove the pin bones from the salmon (see these instructions). Coat a large skillet with 2 T oil and place over medium heat. Season the salmon with salt and pepper. When hot, add the fillets to the pan flesh side down. Cook for 4-6 minutes until the surface is browned. Turn the fish over and cook for 2-5 minutes on the other side, depending on how thick the fillets are. You can use a knife to check that the fish is flaky and mostly opaque. Most experts recommending that salmon be a bit under cooked with a little rare meat in the center. But it is a matter of taste. Remove from pan and let rest for around 5 minutes. This sauce makes more than I can use with 4 servings of salmon; you may want to halve it since it doesn't really store well. Or you can plan on enjoying what is leftover as a vegetable dip or thin it with milk and use it as a creamy salad dressing. I've substituted dill seed for fresh dill but I haven't done it for a long time, so I can only recommend that you use a half teaspoon and taste the result. Add more if you want more dill flavor. It will be a bit crunchier but will still taste of dill. I've been happy to have some rhubarb growing in my garden this year. This is another way to use the "vegetable" before you can't find it any more, although I'm sure you could use frozen rhubarb. Rhubarb can vary in its tartness levels. You may want to taste the compote and adjust the sugar in the whipped cream mixture. The last time I made this, it was plenty sweet for me. Combine the ingredients in a medium saucepan and bring to a simmer over medium-high heat, reducing heat as necessary to maintain a gentle simmer. Cook until the mixture has reduced and thickened. Don't allow the rhubarb to completely break down. Transfer to a bowl and refrigerate to cool. Place both the mascarpone cream mixture and the compote into a mixing bowl. Gently fold one into the other until partially mixed and somewhat streaked. Scoop mixture into serving bowls. Serve as is or use gingersnap crumbles or whole cookies as a garnish. You can also make individual trifles layering the fool with the crumbled cookies. Refrigerate these before serving. I've found the quality of mascarpone cheese can vary quite a bit. My advice is to avoid Galbani brand. If you can't find anything else, I'd suggest substituting with cream cheese. It will be a bit more tart but the texture will be better. I recently finished a course of classes in Turkish cookery taught by a couple of lovely young Turkish women at The Raindrop Foundation, a Turkish cultural center in Albuquerque. The first class featured this dish which, according to legend, was the favorite of a sultan in the Ottoman Empire. The teachers of my class presented this as a casserole with the eggplant mixture spread out in a baking dish, topped by a layer of the meat, but I like serving it individually with the eggplant layer used much like polenta--a layer on a plate, with a ladle full of the meat on top. The type of cheese Turks would use isn't available in United States so the recipe calls for Mozzarella since it can easily be found certified halal (permissible according to Muslim law) . I added some Asiago cheese for flavor but Parmesan could be added instead. You may wish to cook your eggplants as you begin cooking the meat. Place the meat in a lightly oiled pan and cook over medium heat until browned. Add the onion and cook until translucent. Add garlic and stir for 30-60 seconds. Stir in tomatoes (if using whole, smash them a bit) and herbs, and season with salt and pepper and add cayenne, if using. Reduce heat to low and cook until the meat is tender (about 30 minutes) adding a little water if necessary). Fresh tomatoes may not cook down completely. If you are doing the casserole, the mixture shouldn't be as saucy. Remove the bay leaf. Pierce the eggplants with a fork in several places and broil, turning occasionally, until they are softened. Last time I made this, my oven was already hot so I roasted the eggplants which worked fine, too. My teachers let them char, a technique I haven't quite mastered. (This makes for smoky flavored eggplant.) Let them cool, peel and mash them with a fork or finely chop them. Melt the butter in a saucepan. Add flour; stir and cook until it has darkened slightly, at least a minute. Slowly whisk in the milk, stirring constantly until the sauce thickens and becomes creamy. Season with salt. Add mashed eggplant to the sauce, blend and cook for 2-3 minutes. Stir in the cheese. Mix well and remove from heat. Sitr in the lemon juice and grated nutmeg. Pour the bechamel into a casserole dish and cover with the meat. Place in 350F oven for 15-20 minutes until warmed through. Conversely, you can use the bechamel as a bottom layer on a dinner plate, topping with the meat and sauce. Which ever way you do it, top with chopped parsley just before serving. My father-in-law grew up in North Carolina, and I always thought this recipe my mother-in-law makes was from his family. But instead, my father-in-law's mother used to make a vinegar-based cole slaw. From my two years in Chapel Hill, I should have remembered that North Carolinians prefer the vinegar style. 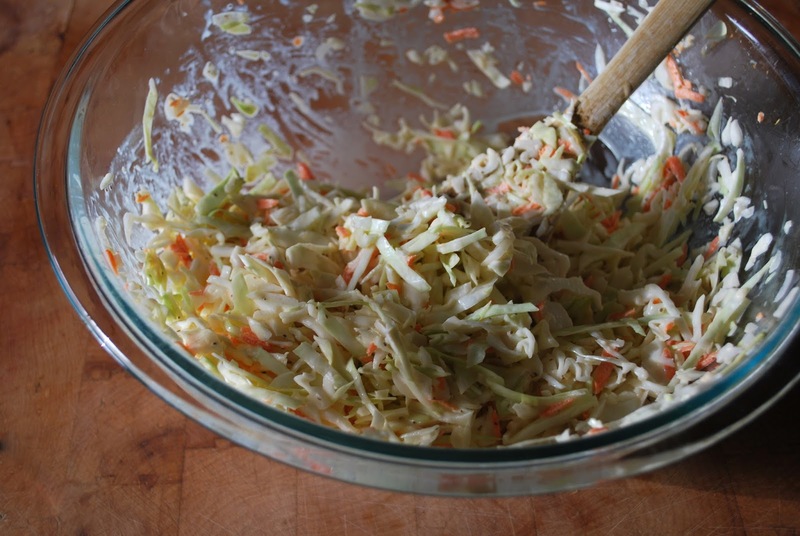 Instead, my mother-in-law adapted this delicious, mayonnaise-based slaw from a KFC copycat recipe years ago. It's a regular part of her table, and now mine. Shred cabbage using knife, a slicer, or a food processor. Peel and shred the carrot. Dice the onion. Mix vegetables together in large bowl. Whisk mayonnaise, vinegar, sugar, salt, celery seeds, and mustard together. Taste and adjust for vinegar/sugar balance. If you prefer a thicker dressing, you can add 2 T mayonnaise. 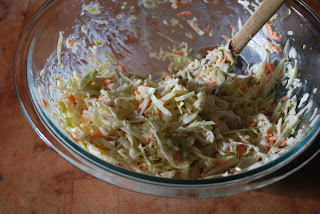 Mix dressing into cabbage mixture a little at a time, to desired consistency: soupy or otherwise. Generally we Americans like to dip our tortilla chips into tomato salsas or cheese sauces or a mixture of the two. Occasionally we like to dip into beans. Here's a recipe for a dip that includes beans but the star of the show is orange-fleshed winter squash. This dip is great for an appetizer, but is hearty enough to be a light meal. Preheat oven to 400F and set rack in the center. Oil a rimmed baking sheet. Toss the diced squash with 1 T olive oil and arrange over the baking sheet. Place in the oven and roast until the squash is tender and lightly browned, approximately 25 minutes. Stir occasionally. Meanwhile, place the remaining oil into a large skillet and heat over medium-high on the stovetop. Stir in the onion, bell pepper, garlic, and jalapeno and cook until the onion is golden, stirring from time to time. Add the tomatoes, beans, zucchini, and cilantro and continue to cook, stirring occasionally until the zucchini is crisp-tender. Stir in the roasted winter squash and pepitas and cook about 5 minutes. Taste the mixture and add salt and pepper. Serve warm with chips. If you want to keep this warm, place in a small slow cooker. The dip can be made ahead and kept refrigerated for 3 days. It can also be frozen for a month or so.